"Star Trek" fans will get a great nostalgia kick from a new book that covers every alien species featured in "The Next Generation" (TNG), from Acamarians to Vulcans. The book weaves together descriptions and observations from a fictional young fan portrayed as watching the show during its original airing, between 1987 and 1994. 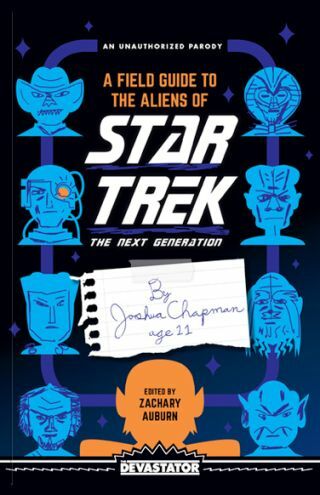 "A Field Guide to the Aliens of Star Trek" (The Devastator, 2017), is written by Zachary Auburn, who has other books in unconventional formats; for example, he used a "Choose Your Own Adventure" style for the novella "Love Is Not Constantly Wondering If You Are Making the Biggest Mistake of Your Life" (Perfect Day Publishing, 2011). His biggest seller so far is "How to Talk to Your Cat About Gun Safety" (Three Rivers Press, 2016). Auburn told Space.com that he remembers being similarly frustrated as a child watching "TNG," but said that as an adult he realizes the true frustrations of watching Troi.For example, Chapman gets upset about the Betazoids, a species that has telepathic powers. "Counsellor Troi is half-Betazoid, which means that she can sense emotions, but mostly she just says things that they [the crew] know already, plus she is really weak and spends a lot of time looking like she has a headache," reads an early entry on the species. Readers of the book will quickly deduce that "Chapman" has troubles with his mother, whom he portrays as controlling and unsympathetic. This turmoil continues throughout the book, and also into an epilogue that contains a fake Q&A with the zines' creator. Auburn added that these experiences are not based on his own relationship with his mother — he and his mom are doing just fine — but on romantic relationships that he had in the past. "Now that I'm older, I recognize that I don't like the way the writers wrote her character, which is not Troi's fault, but the writer's fault," he said. "Early in the series, the only point of worth [she had] was when they needed to show … an alien who was powerful or mysterious, [they'd show that] Troi couldn't psychically read them." Typewritten fonts in later chapters are based on the report cards from Auburn's childhood, and the photos look a little blurry because Auburn manipulated the high-resolution stills we can obtain today. He would take a picture of the television with the camera deliberately out of focus, print it out and then paste the picture into the issue.Auburn took pains to ensure that the "zines" looked as authentic to the 1980s and 1990s as possible. The handwriting in the first chapter is Auburn's own, which appears childlike because he hadn't tried cursive in 20 years. After hours of practice, though, Auburn's writing began to improve. To keep the writing consistent, Auburn would write nonsense words for half an hour or so until his hand got tired, then continue writing the book. And after re-watching much of the series for the umpteenth time, Auburn said he's come away with other realizations about TNG.Auburn acknowledged that a typical publisher may not be interested in publishing pages with handwriting, old fonts and pasted-in pictures, saying he applauded The Devastator for being willing to take on the project and the extra typesetting work. "This is a show written about a utopian society by imperfect people, who, as such, cannot help but let their own sort of biases creep into the show," he said. "The huge human exceptionalism of 'Star Trek' and the Federation [that most characters belonged to] is one of the reasons that ... I like 'Deep Space Nine' a lot more. It looked at the experience of other alien species in a way that was respectful," Auburn said.